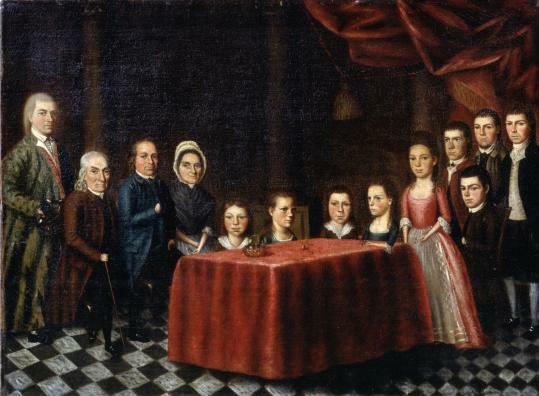 Edward Savage painted “The Savage Family’’ — his family — when he was 18. WORCESTER — An odd little picture, this, to say the least. It was painted by Edward Savage, about three years after the Declaration of Independence was adopted by Congress in 1776. Savage is familiar to us mainly through his widely reproduced portrait of George Washington and his family (National Gallery of Art). That picture, one of the best-known images of the first president, tries to tick all the boxes of formal portraiture: carefully balanced composition; stiff, authoritative poses; clear and uniform perspective; and a few bravura touches, such as the extravagant play of light on Martha Washington’s satin dress. Savage had to teach himself how to do all of that, since he had no training. Despite the stiffness in the figures’ bodies and George and Martha’s awkwardly mismatched gazes, he did a decent job of it. But this earlier, and much less technically accomplished, family portrait — in this case, the artist’s own family — is altogether far more endearing. The composition is a delight. Instead of the usual triangular format favored by group portraitists — shorter people in the wings, taller people gathered near the center — Savage opts for the reverse, as if his family were a herd of elephants conspiring to protect its youngest members from outside attack. Pygmy elephants, of course, because they are all charmingly diminutive. It’s hard to say if this was a pointer to Savage’s future phase as a painter of miniature portraits, but it’s certainly entertaining to see so many large and carefully rendered heads perched atop such pocket-size bodies. (My two favorite details: the hand of the seated old man holding his walking stick, and the twiggy forearm of the girl gazing determinedly off to her right). Was the Savage family unusually rich in twins? It’s hard to say. But the four children sitting at the oddly angled table do divide neatly into two pairs of striking similarity. The older boys hanging tough over on the right, meanwhile, rather confuse the line between close family resemblance and outright doppelgängers. Savage, who was born and died in Princeton, was only 18 at the time he painted this picture. So we should forgive him his little array of technical inadequacies — including the lurching tiled floor. In fact, we might even choose to love him for them. Something about this picture’s odd discordances of scale, its confused perspective, and its odd composition reminds us of burgeoning 19th- and 20th-century attempts in art to favor naivete over virtuosity, awkwardness over polish. Why this growing preference? Because reality is neither smooth nor polished, and it’s hardly ever well composed. Nor, for that matter, are families.